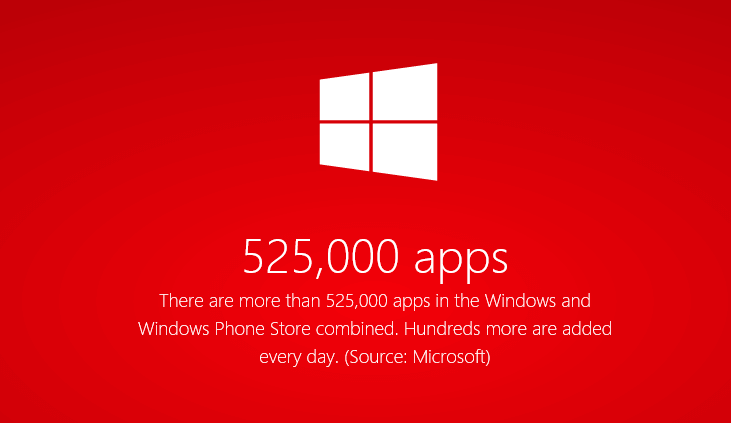 With little fanfare on the By-The-Numbers page, Microsoft has announced that as of September 30, 2014, the combined app total of the Windows Store and the Windows Phone Store has reached 525,000 apps. This represents a 75% growth since the end of August of this year when the stores had a combined 300,000 apps. It is an important milestone for Microsoft but the growth rate is the even more impressive number to take away from this news. combining developer accounts in November 2013. This effort looks to continue in Windows 10 as Universal apps for Windows and Windows powered phones are created (and we see hints of that today already). The 75% growth is staggering if you think about it and is a quantum leap compared to where the Windows and Windows Phone Stores were just a few years ago. Still, it also reminds us that Microsoft has a long way to go in attracting developers and apps. Both the App Store from Apple and the Google Play Store from Google have 1.3 million apps each, nearly three times the amount of Microsoft. At the current pace, it would not be surprising to see the stores reach a combined total of 750,000 apps by the start of 2015. Given the significant number of releases that Microsoft is expected to have, including Windows 10 for all devices, it should be a good way to start the new year.